Is the roof paint faded or peeling on your Sunshine Coast home? If so, you might want to consider getting it repainted. Roof paint is vital for preserving your roof and protecting it against the weather. In addition to this, a well-painted roof looks great and can improve the comfort and aesthetic of your home. When it comes to roof painting on the Sunshine Coast, the team here at Strongguard is here to help. We offer targeted roof painting services that are designed to bring your roof back to life. With over twenty years of experience, we know what goes into a perfect roof painting job and we are well equipped to deliver the best results. Each of our jobs is completed with quality materials using a proven, step-by-step painting process. If you are looking for reliable service from experts, then look no further than Strongguard. Here at Strongguard, we know that painting roofs is not a matter of simply applying the paint and letting it dry. Roof Painting involves careful planning and flawless execution. Over many years of operation, we have refined our roof painting process to account for the unique needs of our Sunshine Coast clients. We know that your roof will no doubt be faced with long summers and hot sunlight. That is why we prepare each roof we paint to perfection. In addition to this, we combat the issue of faded paint by using only the best paints. These come from industry leading brands such as Dulux and Shieldcoat. We have seen firsthand the durability of these paints, which is why we trust nothing else. We have a team of dedicated experts to carry out our targeted roof painting process. Our roof painters are amongst the industry’s most proficient and they bring a wealth of knowledge and experience to every job. Furthermore, we have expert estimators who work with you to identify the perfect paint for your roof. A large selection of paints for you to choose from. At Strongguard, we take the time to ensure that your roof painting job is conducted to an unrivalled standard of quality. Our process is designed to make sure that your roof is prepared for painting, so that you get the ideal finish for your roof. We offer efficient service and thorough attention to detail based on our many years of experience. This means that your roof will be left in the best possible condition at the completion of every job. Before we begin preparing your roof, we set up guiderails and scaffolding, which allows us to operate safely on your roof. 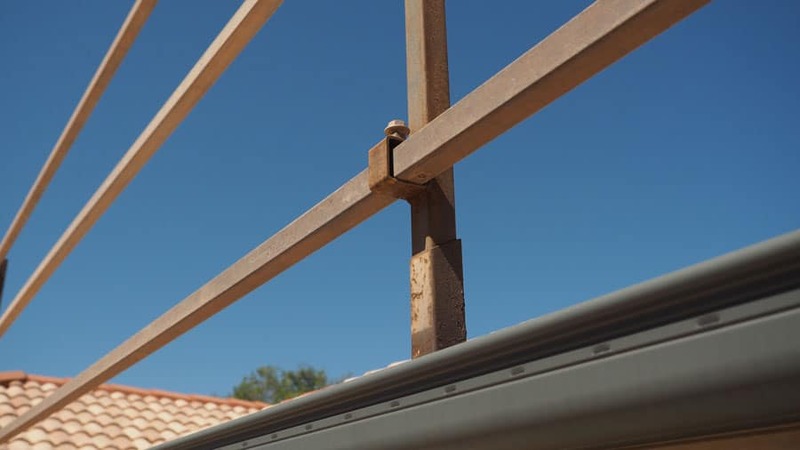 Following this, we will repair the parts of your roof that require some maintenance. These usually include broken tiles and caps. Once the repairs are complete, we can begin cleaning your roof. We do this using a high pressure cleaner. This shoots jets of water at extremely high pressure and allows us to remove all impurities from your roof. Once clean, your roof is ready for the next stage of preparation. This stage involves repairing the capping on all the roof tiles, before applying a specialised mould treatment. 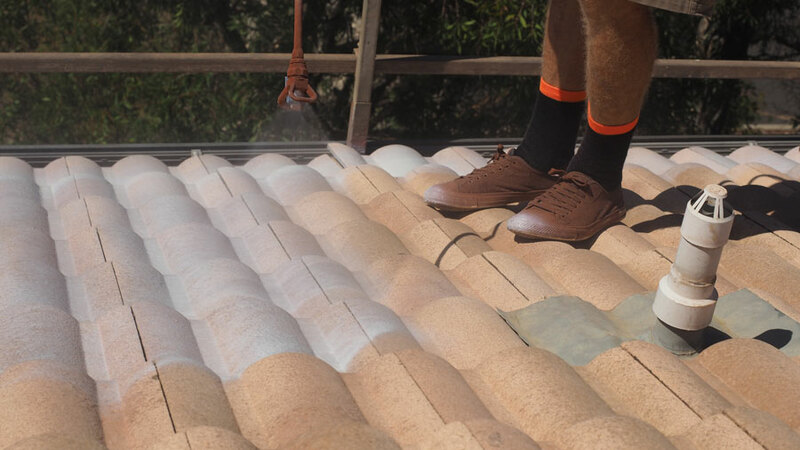 This treatment prevents the growth of mould on your roof tiles and ensures that paint is applied evenly and protected against potentially damaging mould in the future. After this, we can hand paint the gable ends and flashings on your roof, then mask them off. We do this to prevent unsightly overspray. By this stage, your roof is in perfect condition and can receive its first coat. This coat is a primer seal and it lays the foundation for the coats that are to follow. We then apply two coats of high quality membrane, which serves to protect the roof against weather and fading. The membrane ensures that your roof’s colour retention is immaculate and it prevents any unsightly deterioration in the future. If you would like a new coat of paint on your roof, then contact Strongguard today. We understand the needs of our clients in the Sunshine Coast and our services are designed to work around your needs specifically. Our experienced team is happy to address any of your queries and you can contact us over the phone, or through the ‘contact us’ section of our website. #1 Can I change the colour of my roof? At Strongguard, we recognise that everyone has different preferences when it comes to colours. To account for this, we offer a selection of over 70 different paints for you to choose from. These paints are all of unrivalled quality, which means that you do not have to worry about quality when making your choice. Painting your roof is great time for you to get creative and redesign the aesthetic of your house a little. If you aren’t happy with your roof’s current colour, we will help you change it. We encourage you to choose a colour that reflects you. To help you with your decision, we have expert estimators. Our estimators have a lot of experience when it comes to working with paint. As a result, they know precisely what paints are suited to your roof. With their expert knowledge behind you, you can explore our range to find the colour that appeals to you most. #2 How long will it take you to paint my roof? 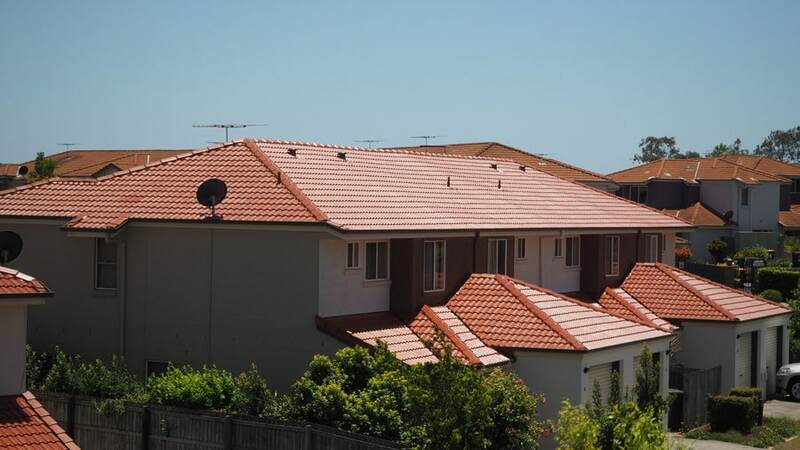 The team here at Strongguard comprises the Sunshine Coast’s most proficient roof painters. This means that you are guaranteed the most efficient service. Generally speaking, we finish our roof painting jobs in 2 to 4 days, although this is subject to several factors such as the weather. Certain weather conditions simply do not allow for roof painting due to both safety and quality control. You won’t have to wait long with such experienced painters at your disposal, however. We follow a time-tested painting process that is designed to thoroughly prepare your roof for painting. Having done this many times before, we can give you an accurate estimate of the time it will take us to paint your roof. In the right conditions, we will complete your job in no time at all. Not only this, but it will also be done to the highest standard. #3 What paint will you use to paint my roof? Quality is at the centre of everything we do here at Strongguard, which is why we insist on Dulux and Shieldcoat paint. Having been in the industry for over 20 years, we have witnessed the evolution of roof paints into the advanced products that they are today. We have a wealth of knowledge when it comes to roof paint and we trust Dulux Acratex and Shieldcoat Roofbond above all else. These products have stood the test of time and we know them to be leaders in the field of roof painting products. In addition to this, they offer advanced reflective heat technology. With this, you get active protection from the harsh sunlight of the Sunshine Coast. #4 What warranty options do you offer? Here at Strongguard, we put our name behind every job we complete. We have complete confidence in both our workmanship and the products we us. To support this, we provide a ten-year warranty with every roof painting job we complete. You are covered for workmanship and roofing membrane with this warranty. This means that your roof paint is guaranteed to last and you are protected in the event of any shortcomings. Upon the completion of your job and the payment of your bill, your warranty will enter into effect. So simply sit back and enjoy the advanced protection and smooth finish of your freshly painted roof. With us, you will be safe in the knowledge that your investment is protected. Insurance is vital in the roofing industry, which is why we have taken action to ensure that we are thoroughly insured for every job that we do. In fact, Strongguard is insured for public liability and products liability. This means that any damage or harm arising in regard to either is covered fully. Our insurance covers us to the sum of $10 million, which is sufficient to protect any one of our jobs. We take pride in our work and every job is completed with care, so the likelihood of our insurance being necessary is minute. Nevertheless, we value the protection it offers to both our clients and us.